The most common reasons, or excuses, that people give for missing breakfast or any other meal of the day is that they do not have the time to prepare and cook their food. Even something as simple as bacon and eggs take too much time in the morning – staying for the clean-up will definitely make you miss your chance of beating the rush hour traffic or in my case, would result to a fussy toddler demanding for some attention. With Kalorik’s new vertical cooking equipment, it only takes minutes to get your meal from the kitchen to the table. You will even have time to clean up too and still make it to work on time. It looks like one of those camera lens thermal flasks but it’s really capable of much, much, more. The Kalorik Rollie™ Eggmaster’s diminutive size is a stark contrast to what it can do. It can give you quick and easy meals that are healthy yet convenient to prepare. I was initially wary of how something that looks more like a flask than anything else could cook eggs, french toasts and a whole lot more – perfectly each time it even claims. When we tried it out though, we were amazed at how food pops out, perfectly cooked! My toddler thinks it’s magical and he’s now looking forward to watching me “cook” food. Why am I and other moms raving about the Rollie™ Eggmaster? Well, here are three reasons why I am absolutely loving it! Quick and fuss-free preparation. You do not need to deal with mixing bowls and pans when you cook your eggs with the Rollie. You simply plug the Rollie in, wait for the light to turn green, and you are ready to cook. For meat and veggie ingredients, you just have to use the skewers that come with your Rollie. Stick the skewered ingredients into the vertical cooking cavity, crack and pour your egg, and then wait for your food to pop out perfectly cooked. The package comes with a recipe book that gives ideas on what other food to cook other than omelettes and egg burritos. Healthy cooking. All you need to cook with your Rollie is a thin coat of non-stick cooking spray in the cooking chamber. Just spray it on before you plug your Rollie in. The vertical cooking technology in the Rollie will be ready for your eggs or any other food that you want to cook when the indicator light turns green. Your food turns up perfectly cooked all the time. You do not have to worry about undercooked food causing health problems for you and your family. Convenient clean-up. This piece of kitchen gadget is small enough to fit even cramped kitchen spaces, handy enough with its silicone grip, and convenient enough to clean. 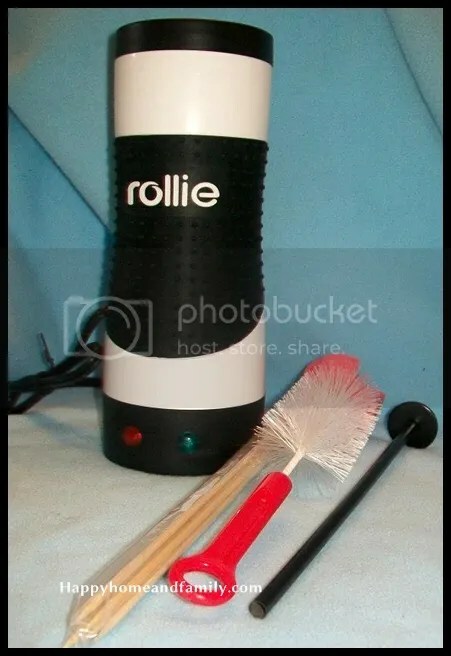 Every purchase of the Rollie comes with a round brush that takes care of cleaning the cooking chamber. Wiping down or washing with warm soapy water is all that is required to keep this gadget clean. Another notable advantage of the Rollie is the convenient handling – you do not have to worry about burns, oil splatters, or messy spills. I love the Rollie so much that I know you would want your very own Rollie™ Eggmaster too. You can purchase the Rollie here for only $29.99 and get some freebies as well. For more reviews, updates on promos, and new recipes, check out Rollie on Facebook and Twitter. To check out Kalorik’s other awesome innovative products, follow Kalorik on Facebook and Twitter too. One lucky reader will receive a Rollie Eggmaster! US only. Must be at least 18 years old to be eligible. Ends April 30 at 11:59pm EST. To enter, use the widget below. Good luck! I want a Rollie Egg Master! I’m not much of a morning person. Breakfast normally consists of coffee. And more coffee. After seeing it on the Colbert Repor I need one! A healthy breakfast made easy! I like all different kinds of eggs. Pancakes with peanut butter and coffee! I always start the day with a healthy breakfast of oatmeal or pancakes. I add a sprinkle of Linwoods flax, cocoa, strawberries & blueberries blend with added sliced almonds & pb2 powdered peanut butter. The Rollie would provide an easy way to add variety including egg recipes. I like egg white omelets with mushrooms, onions, and cheese! I’m not a big breakfast person, but lately I’ve been loving Belvita breakfast biscuits. I love cheese omelette s.
I love broccoli and cheese omelets. Thanks for the chance. This is really neat way to make eggs! I would have never thought of this! Awesome product! I like cereal for breakfast. Bacon, eggs, gravy, and biscuits. Eggs Benedict is my favorite breakfast. I love bacon and eggs, but I rarely have it. Thanks for this giveaway. Occasionally we like to treat ourselves to Swedish Pancakes with Lingonberries and Sausages. One of my big favorites is a Greek Omelet filled with steamed or sauteed FRESH Spinach and Feta Cheese (occasionally I toss in some sauteed Mushrooms, too. This looks like a great way to get a fast, healthy breakfast. my favorite breakfast is scrambled eggs with cream cheese, bacon, and toast. My favorite breakfast is scrambled eggs. Dippy eggs and toast and bacon.